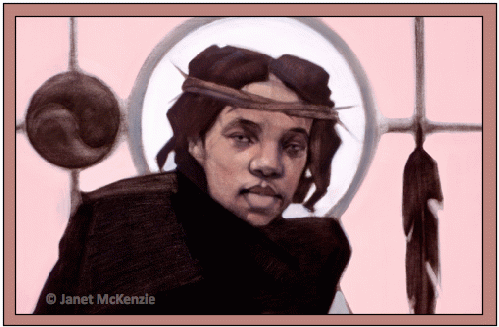 First unveiled on NBC's Today Show in 2000, Janet McKenzie's painting, Jesus of the People was the first place winner of the National Catholic Reporter's global competition to identify an image of Jesus for the New Millennium. 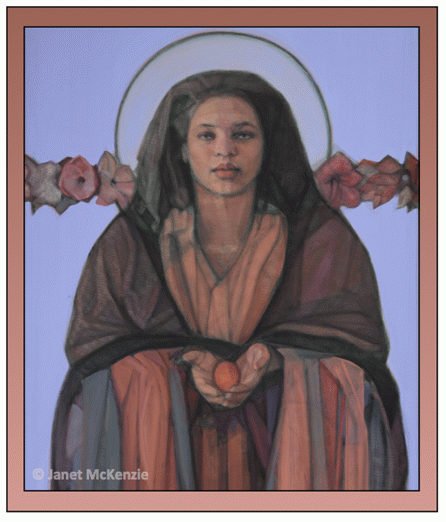 Janet paints multicultural images which honor gender and race, spotlightighting women and people of color, both of which she notes are under-represented in iconic Christian imagery. 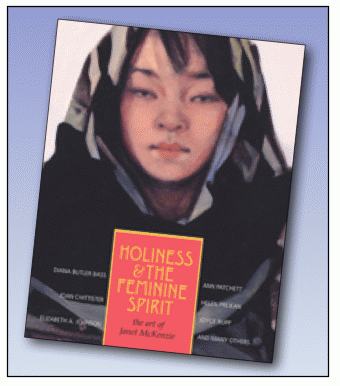 Janet's dark Jesus reflects both feminine and masculine aspects, which has generated "shouts of praise and threats of death," notes Susan Perry, the visionary editor and compiler behind the book, Holiness and the Feminine Spirit: The Art of Janet McKenzie(Orbis Books, 2009). The book features 29 paintings and accompanying text by writers of different faith traditions including Sr. Joan Chittister, O.S.B. (author of over 50 books and co-chair of the U.N.'s Global Peace Initiative of Women, author China Galland (author of Love Cemetery: Unburying the Secret History of Slaves and Longing for Darkness: Tara and the Black Madonna. ), Sr. Helen Prejean, S.C.J. (author of Dead Man Walking: The Eyewitness Account Of The Death Penalty That Sparked a National Debate), and Bishop Katharine Jefferts Schori, Presiding Bishop and Primate of the American Episcopal Church. Janet has received much more support than vitriol. However, in response to Jesus of the People, the infamous Westboro Baptist Church sent hate mail to Janet as well as to Sen. Patrick Leahy, Sen. Bernie Sanders, and to then-Governor Howard Dean. Westboro threatened to picket outside of McKenzie's home in Vermont. When a sudden snowstorm prevented them from making the trip, McKenzie suggested, "I guess God provides." 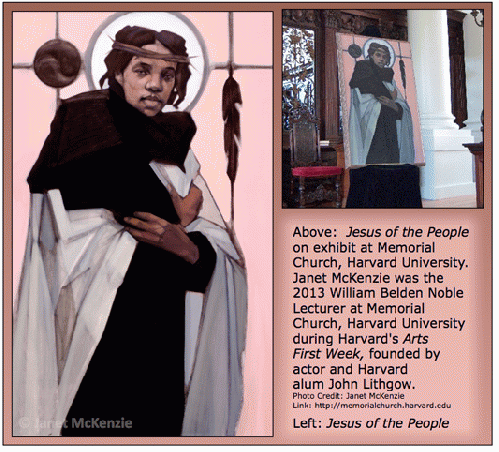 Fifteen of Janet's paintings, including the rarely seen Jesus of the People, are currently on exhibit at the The Waitsfield United Church of Christ during the Vermont Festival of the Arts. Reviewer Gary C. Eckhart notes: "Yes, the paintings have strong religious overtones and indeed, they are displayed in a church. This might not be to your liking; however, set these thoughts aside and view the exhibition for what it is -- a collection of contemporary masterpieces by a gifted artist." 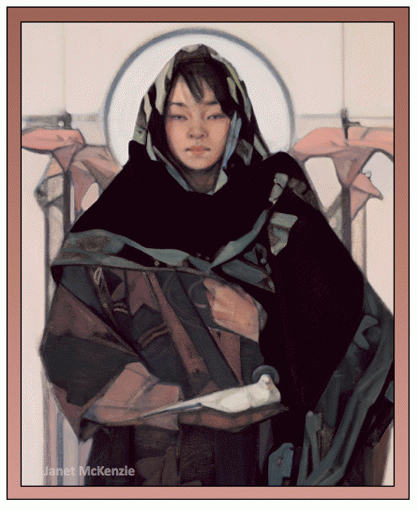 The exhibit, Holiness & the Feminine Spirit, continues through August 31, 2014. A native of the greater NYC area, Janet studied at the Art Students League of New York and was one of the youngest recipients of the prestigious Edward McDowell Traveling Scholarship, which provided a year in Europe to study and travel. Founded in 1875, well-known alumni of the school include Georgia O'Keeffe, Norman Rockwell, Winslow Homer, Peter Max, Al Hirschfeld, Roy Lichtenstein, and Claudette Colbert. Meryl Ann Butler: Thank you for visiting with us, Janet! Vermont seems to support more than its fair share of forward-thinking visionaries, between Bernie Sanders who is well-loved here at OpEdNews, Vermont's courageous stand regarding GMO labeling, and as home to your stunning art! And by "stunning," I mean beautiful, but also that you "stun" people with your subject matter. Offering a shocking visual experience is a way to direct a viewer's attention to your message. For instance, when Georgia O'Keeffe was asked why she painted such large flowers, she responded, "A flower is relatively small. Everyone has many associations with a flower - the idea of flowers ... Still -- in a way -- nobody sees a flower -- really -- it is so small -- we haven't time -- and to see takes time, like to have a friend takes time " So I said to myself -- 'I'll paint what I see -- what the flower is to me but I'll paint it big and they will be surprised into taking time to look at it -- I will make even busy New Yorkers take time to see what I see of flowers:' Well -- I made you take time to look at what I saw." So it seems to me that you are capturing the attention of your viewers in a similar vein, although rather than using scale, you are using subject matter. Can you share with us a little about the message that you would like your viewers to "hear"? View All 40 Articles in "Art & Creativity"
Other Series: View All 21 Articles in "Spirituality & Religion"